First of all Happy New Year to all readers of Travel Umbria! 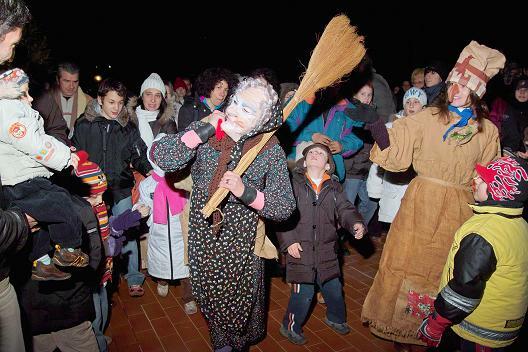 Hoping that 2012 will be a great year for all, let's start with an event in January, one that closes the Christmas period and celebrates one of the most famous "old ladies" in the world, the Befana. I am talking about Epiphany, which in Umbria is a very important local tradition event. Epiphany is celebrated in all corners of the region, from small village to large cities; Here is offered a brief review of the events tied to Epiphany in Umbria in 2012. Let's start with Lake Trasimeno that for Christmas 2011 hosted the event "Christmas Island" set in the picturesque scenery of the Polvese island. The event began on December 17 and closes its doors on January 6 with the Epiphany celebrations. During Epiphany day the calendar of events ranges from Circobus to the concert of the Philharmonic Society of Mugnano, finishing in style with fireworks over the lake. During the day you can visit the Nativity scene of the area and taste the typical products of craft markets and receive gifts directly from the Befana! In Assisi, more precisely in Rivotorto of Assisi on January 6 all visitors are invited to turn their eyes to the sky. They will assist to the descent of the Epiphany. The nice old woman will be equipped with a paraglider, and after launching from Mount Subasio she will land in Rivotorto to bring gifts to children. The event is called "La Befana comes down from heaven". Celebrations of Epiphany in Valnerina binds to the so-called "Pasquarelle". The term indicates the typical Easter songs, that the tradition relates to the Annunciation to the peoples of the Child Jesus by the Wise Kings. The night between January 5th and 6th, pasquarellanti (or pasquarellari depending on the area) begin their journey along the streets of town, knocking on house doors to announce the Epiphany through folk songs (the so-called Pasquarelle) newly composed every year in occasion of the event; pasquarellanti are then thanked by families with good wishes, greetings and gifts that consist of foods, sweets and sometimes money. In addition to the tradition of the Valnerina Pasquarelle Epiphany greets 2012 with the appointment "Befana comes from the River" held on January 6 at 5 pm at the Canoe Center of Arrone. The event is organized with the participation of local paddlers of kayaks and canoes that will accompany the Befana along the River Nera up to Arrone. There she will distribute stockings filled with gifts for children.